Distance: 26.8 kilometers with about 230 meters elevation gain (16.64 miles with around 750 feet elevation gain). First - I accidentally deleted two comments on my blog instead of publishing them. The first was from a woman who lives in Australia and the second was from a woman who is soon starting the Camino with a group of other women - she liked Raphael's comment. Ladies, I apologize - the deletion was accidental. Please comment again and I'll happily publish your words. I hit the wrong button by mistake on my iPad. I am not trying to censor you or you opinions! Second - today's thanks goes to all the hospitaleros who make such an effort to welcome pilgrims into the albergues. Your job requires patience, a good nature, and a sincere desire to help others. You men and women are the people who truly make the Camino a positive and uplifting experience -- so thank you. Third -- I don't have a lot of photos today and I'm not sure why! My apologies! My leg felt a thousand times better as we walked out of Burgos. The girls and I were refreshed and well-rested from our day off. The weather was perfect too -- all felt right with our worlds as we left the giant megopolis. 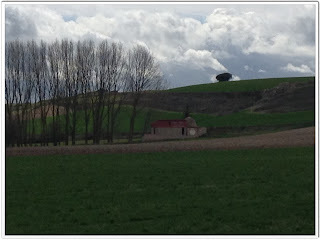 We walked out of Burgos and into the countryside, through Villalbilla, and to and through Rabe de las Calzados. We stopped in Rabe de las Calzados for a snack. This is a lovely town; the people are friendly, I hear the albergue is excellent, and the kind fellow at the bar gave the girls free Camino charms. I was able to purchase credencials here (we have a lot of stamps and will likely run out of room on our originals before we reach Santiago). We would have stopped here for the night if we hadn't wanted to walk more miles. Onward, into and over our first Meseta. The Meseta is similar to the American mesa...except in Spain, there's less iron/clay and a lot more grass. We entered the town of Hornillos del Camino...to find the main street flooded. The recent rain and snowmelt caused the local river to jump its banks. We could have waded across if we had to...it wasn't a dangerous crossing...but a friendly fellow was giving peregrinos literal lifts in his bulldozer. 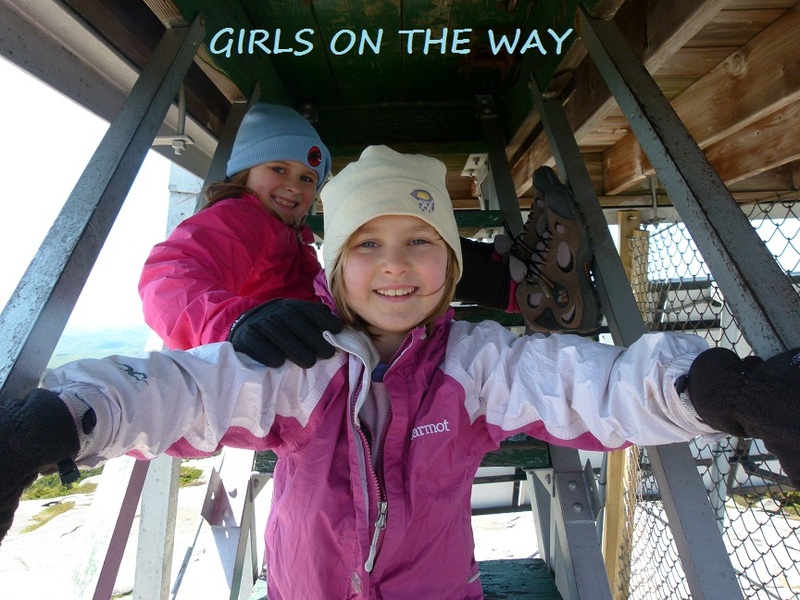 The girls jumped at the opportunity to ride in the "scoop" section of the bulldozer (and, I have to admit, so did I). I had heard a lot of negative things about this albergue from people who had stayed here last year and the year before. I therefore inquired about getting a room at the local Casa Rural, but the Casa was already full (and the first floor was flooded). Please note that I have not stayed at the public albergue myself and it might be just fine now, I truly have no idea how it is at present. What I do know is that when we arrived around 1:30, no one knew where the hospiterala was and there was already a line outside the door. The local bar was packed with pilgrims and there was nowhere to sit down. The girls and I sat outside, talked it over, and decided that we had the will and the energy to press on and try our luck in San Bol. We had already walked 13 miles, but we felt good after our day off and felt we could handle the additional 3.5 miles to San Bol (one small albergue) or, if necessary, the 6.5 miles to Hontanas (many albergues). Pressing on, up and across another Meseta, toward San Bol. The additional 3.5 miles went quickly (we ate a lot of chocolate...that always helps) and we soon saw the lone albergue...San Bol, nestled in the poplar trees in the middle of the Meseta...it's the little building to the right of the grove. San Bol used to have a reputation for having an unruly party scene. Folks used to camp outside, spend all night singing and drinking (and smoking interesting cigarettes...), etc. I had heard that the albergue had recently been "cleaned up," so to speak, so the girls and I wanted to check it out. We are so glad we did!! San Bol now has a welcoming, warm, friendly hospiteralo and the place feels like a peaceful retreat. Cost is five Euros per person. One can either cook one's own dinner or pay an additional seven Euros for a communal dinner. We bought the dinner, as did the five other people who stayed the evening. It was delicious! Three course meal with wine..scrumptious. The other peregrinos were in as much need of relaxation as we were. In fact, all of us took a three hour nap before dinner, then we all went to bed at 8:30 and slept ten straight hours. We were probably the most sedate and peaceful group the hospiteralo has seen thus far, lol. There was a couple from England, two ladies from Spain, and Deitmar from Germany. There was a time change in the morning...we already did that in the States, now it's Spain's turn, I guess...so we all woke up past the time we were supposed to leave. Didn't matter that much, since the hospitalero also woke up late. He was very gracious about everyone's tardy departure. Alex said this was the best night's sleep she's had since we began our Camino (hotel stays included!). The atmosphere was perfect and the location was gorgeous. We were treated to a beautiful sunrise over the Meseta the next morning...two enthusiastic thumbs up for San Bol. Note that you will need a sleeping bag to stay here. There are blankets, but there is no electricity so therefore there is no heat. We were fine with our bags and blankets. Note also that there are a few things for sale here in the albergue (wine, cookies, nuts, etc). If you are starving and don't feel you can make the next 5 kilometers to Hontanas without eating something, then you can stop in and purchase something even if you don't want to sleep here. Though we do highly recommend sleeping here. Our experience was peaceful and we all felt extraordinarily well-rested the next day. You have all inspired me. I leave Australia for my Camino on Monday, so I will miss your blogs. Travel well, God bless and buen Camino. I like your style of travel, just go with the flow and do what feels right. I have read that in Santiago you can actually get a tour on the roof of the cathedral. Thanks for sharing and Buen Camino! I am so glad your leg is better and that you are taking a day off. I was on the Camino for 3 weeks last Fall and will return in May 2014 to do the entire route. I am taking note of all the alberques you talk about. I think you and your daughters are amazing! I'll follow you all the way across Spain through your blogs. Buen Camino! That's the one thing I worry about and I am glad you mentioned it. Peregrinos that are noisy and stay up, thus keeping me up. If I don't get any sleep I get rather crabby and it makes me feel completely out of it. I will make sure I budget for more nights in private albergues/hostales so I can have the alternative to get much needed rest. I love reading your posts and love the pictures. Ánimo y bien camino. Hello, Girls!! I am inspired by your travels so early in the spring and I plan to share your blog with our Halifax NS chapter of the Canadian Company of Pilgrims......assuming that is alright! I hope you find the Volterin effective. Buen Camino and many blessings! Ah-ha! I remember walking past San Bol. We thought it was all sealed up. Nice to know its open and such a great restful place. next time :) !! Hello girls! Our camino finished by the moment, but reading your blog feels like we keep walking. We remember you daily in our chats with family and friends. Rosa wants me to say you Buen Camino. Ildefonso, we were so pleased to meet you and Rosa, and to get to know you both a little during our Camino. We loved your company. Thank you for making our Camino special. Many good wishes to you and your family. Grace, I'd be honored if you shared our blog. Thank you.